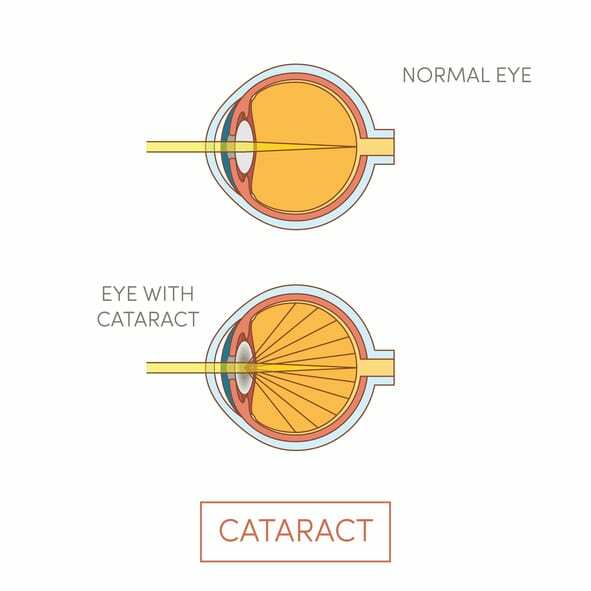 Cataracts cause a clouding of the lens within the eye or its surrounding transparent membrane that obstructs the passage of light. There are a few types that affect the lens of the eye differently, but all have the same symptoms. The most common symptoms are cloudy or blurry vision, glare from lights, poor night vision, and/or double vision. The exact cause varies. The lens in our eye works similarly to a camera in that it focuses light onto the retina for clear vision. The lens of an eye is mostly water and protein. As we age, the protein may clump together and start to cloud the small area of the lens. Aside from aging, there are a several risk factors that will advance the process. Below are the most common risk factors. If you have one or more of these risk factors, we recommend that you have a routine eye exam with an ophthalmologist to manage your eye health for prevention and early detection of any diseases. Extended exposure to UV light has been linked to eye damage such as cataracts and macular generation. One simple way to reduce this risk is to consistently wear sunglasses that block 100% UV light. Diabetes is the primary cause of blindness is adults ages 20 – 74. It all has to do with high levels of sugar (glucose). When you have high levels of glucose in the lens of your eye, it swells, which affects the clarity of your vision. The lens also has an enzyme that coverts glucose to sorbitol. The sorbitol will then collect in the lens (due to the high levels of glucose) affecting the proteins. If you are managing diabetes, one way to reduce your risk is to maintain a healthy level of sugar. High blood pressure can put strain on the blood vessels in your eyes and cause swelling in the optic nerve. This strain can cause a variety of eye problems including cataracts. You can reduce your risk by maintaining a healthy blood pressure. Although there is no direct link between obesity and cataracts, it is considered a risk factor because of the health implications caused from being overweight. First, any extra weight you are carrying can put additional pressure on your blood vessels, which we know can affect cataracts. Second, our eye health is linked to nutrients such as antioxidants, vitamins C and E, as well as omega-3s, which may not be incorporated into one’s diet. Aside from maintaining a healthy weight, those that are obese can reduce their risk by maintaining a healthy blood pressure and incorporating the proper nutrients that have been shown to benefit our eye health. Learn more about best foods for eye health here. Studies have shown that smoking cigarettes doubles your chances of developing cataracts, and the more you smoke, the higher the risk becomes. The best way to reduce this risk is to quit smoking. Contact your local health professional for assistance, if needed. Studies show that long term use or high doses of steroids can promote cataract formation. Those that consume a combination of oral and inhaled steroids are at the highest risk. If you use steroids regularly, we recommend that you tell your ophthalmologist about any prescribed medications during your routine eye exam. Those taking statin drugs are 30% more likely to develop cataracts. We are not suggesting you stop taking these drugs if medically prescribed, but we do recommend you have regular eye exams with an ophthalmologist. Unfortunately, there is nothing we can do to erase your history with eye injuries or surgeries. If you have a history of eye injuries, we strongly encourage you to have consistent eye exams with an ophthalmologist. When an individual is using hormone replacement therapy (HRT) they are 18% more likely to develop cataracts than those who have never used HRT. The estrogen in HRT increases the levels of C-reactive protein, which is associated with cataract development. Heavy drinking (2 or more drinks per day) can increase your risk because the chemicals found in alcohol damage the optic nerve. If you enjoy alcoholic beverages, you should ensure that you’re consuming the proper nutrients needed to boost your eye health to reduce your risk of developing cataracts. Myopia is one of the most common eye disorders in the world (30 – 40% of adults in Europe and US, up to 80% or higher in the Asian population) and recent studies have shown that cataracts develop sooner in highly myopic eyes compared to normal eyes. While your family history and previous health conditions are outside of your control, you can focus on the things that you can control such as a healthy diet, wearing sunglasses, and consuming alcohol in moderation. If you are experiencing cloudy or blurry vision, contact the specialists at Florida Eye Specialists and Cataract Institute today.